Chevy has been promising that its brand new Bolt all-electric vehicle will go on sale later this year at “around $30,000,” which sounded pretty sweet, if not a little vague. Well now we have some solid figures, with the Bolt going on sale for $37,500 before federal tax credits. After federal tax credits, which are worth $7,500 for most electric vehicles, the 5-door hatchback comes in, as promised, at $30,000 — before state incentives. 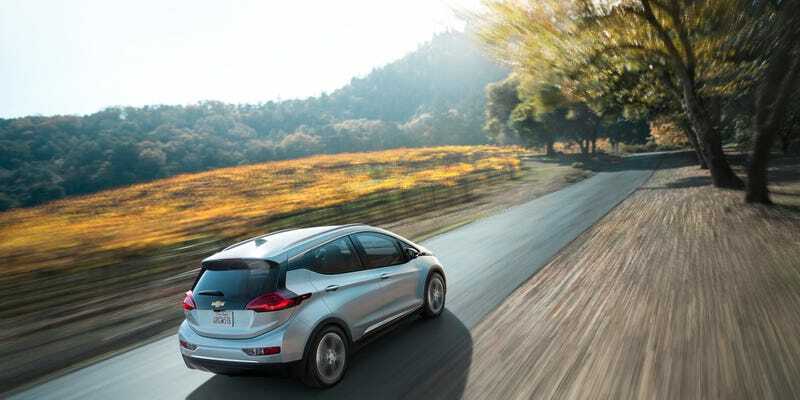 That’s right, in some states customers will be available to purchase the all-electric, practical, inexpensive Bolt with a 200 mile range for less than $30k. That’s quite possibly the best EV deal on the market (for now). Chevy is claiming the EV can recharge its battery pack to a full charge in nine hours using the 240-volt home charger. GM CEO Mary Barra claimed that the car could charge to 80 percent in “just 60 minutes,” and it is not uncommon for batteries to charge faster to 80 percent than the last 20 percent — however I should note that GM hasn’t repeated this figure in any press materials outside of Barra’s CES keynote. Jalopnik will have an explainer on EV charging soon. The car features a 10.2 inch infotainment screen with Chevy’s customizable MyLink system and an 8-inch dashboard display. That’s not to mention all of the benefits of a typical 5-door hatchback, with the EV offering no compromises over traditional alternatives. The car also features “game-ification” of the Bolt driving experience, where the miles-per-charge and mpg-equivalent figures are compared to other owners’ figures as a competition, because Chevy thinks zero emissions are a game. Of course gas is currently at its cheapest national average in years at around $1.97, which could make it tough for consumers to go electric. But an EV with the “long range” of the Bolt is perfect competition for other fuel-efficient cars at the same price for many consumers, just without the cost of keeping the tank full. So what’s it going to be, America: deal or no deal?